Have fun in Delaware! 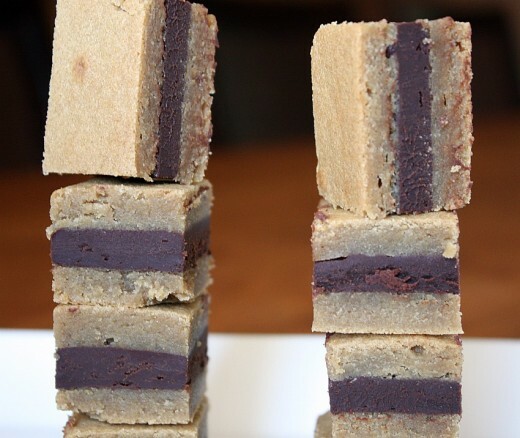 These bars look scrumptious. Stunning. I mean really stunningly beautiful bars. And thanks for the tips, too. The shortcut-taker in me needs a reminder that some instructions in life really aren’t optional. Have a lovely trip east. When are you coming to sing & play guitar for ME? These look drool-worthy! I just bookmarked them and can’t wait to try! Absolutely beautiful! Looks like you’d need a mug of coffee or tall glass of cold milk to accompany these sweet treats. Have a wonderful vacation! I can totally relate … we let Nelle watch as much TV as she wants to on the plane. and coming from Australia this turns her into a zombie by the time we hit – well, any other continent. You know what Delaware is? Close to NYC. Just saying. These bars sound AMAZING. I am so sold on making them. Oh, these look simply amazing! I’m headed off to scan the kitchen to see if I have all of the ingredients on hand right now. 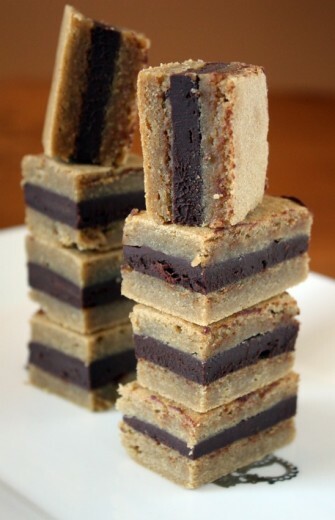 Okay, I don’t know how anyone could look at this recipe and wonder, “How could this be good?” The name of the recipe is Ganache-Filled Brown Sugar Bars. That’s all the proof I need! These look amazing, I can’t wait to try them!!! Waxed Paper, really? I’ve been loath to use wax paper every since attempting a Nigella Lawson macaroon recipe that called for putting them on waxed paper before baking. They stuck horribly and I always figured the “wax paper” part was a mis-translation for parchment paper. Michelle, the one time I tried to bake using waxed paper, it created a horrible scary smell in my kitchen. I would probably use parchment here, myself. I don’t have a sweet tooth, but apparently your bars have an effect that is independent from it. Gnosh Shmosh, these look amazing! Sinful! always use parchment but did not here. The batter almost completely covered the paper and I did not leave much of an overhang at all. Maybe an inch. I’m sure parchment would be fine. Yes, please! These look soooo good! These look amazing and I’m sure my boy would be all over them if I ever convince my hips it would be a good idea for me to make these. And have a fabulous time in Delaware – I think it’s fair to say your boys will – beach, popsicles, family, rides – sounds like my boy’s dream vacation (not to worry about him, we’re going on our version in a few weeks). Oh my god. I just had to say that these look amazing! I just tried these and for some reason, they wound up turning out nothing like yours did. I did halve the recipe and use an 8×8 pan, so maybe that was enough to jinx the whole thing, but I wound up with a very flat, dense, intensely sweet and gooey center with edges that were too crispy. I also had trouble with the wax paper sticking to the cake horribly, despite buttering and flour-ing it well. I trimmed the crisped edges and my family went nuts over those while I stuck the ganache-topped center in the fridge to chill and firm up, so I can’t call this a disaster or anything – I was just wondering if you had any ideas as to what could’ve happened to make them turn out so differently. Yours look so gorgeous, and mine are..well, not something I’d be serving to a crowd, to say the least. Dana, can you elaborate on what you mean by halving the cake crosswise? I was picturing slicing slicing it horizontally, creating two 10×15 cakes, but I’m in the process of making these now and my cake is so thin I can’t imagine being able to really slice it that way. I may slice it right down the middle and create smaller, really thick bars. Thanks! 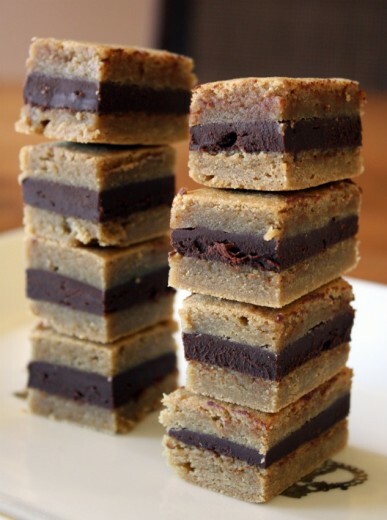 I tried making these this morning and I decimated the cookie bars when I was trying to cut them. Next time I think I will bake 2 8×8 batches of brown sugar bar and then just layer them with the ganache. These look incredible. Anything with brown sugar and chocolate cannot be bad. Just wondering… would these bars travel well? I want to ship them to a friend in the next state over, but am curious as to if they would need to be refridgerated. 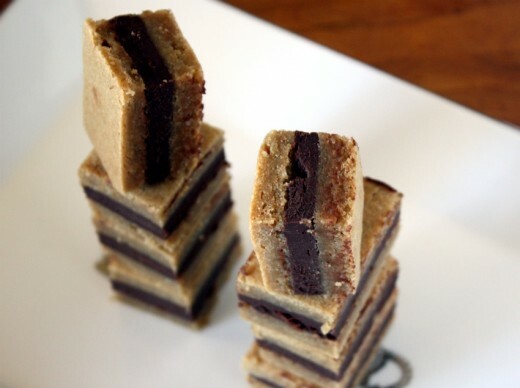 These look both insanely good and insanely decadent! Just made these and with gluten-free flour! They turned out DELICIOUSLY! Here’s the link to my blog so you can see the entry if you’d like!